The Boston Symphony Orchestra went decidedly intellectual on us last night with two-thirds of its varied program inspired by classics of the written word. It took some effort to connect the music to the writings but one needn’t have bothered. This glorious music stands on its own. 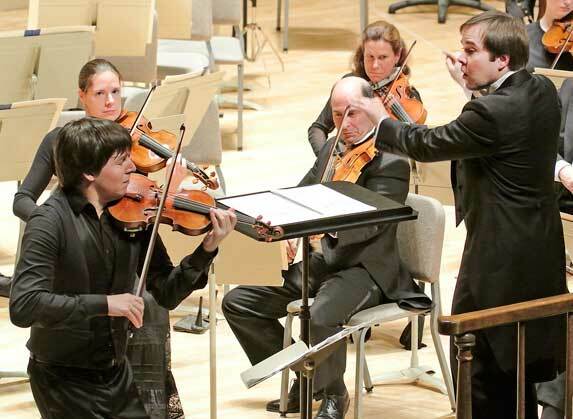 The program, scheduled to be repeated at Symphony Hall this afternoon and Saturday evening, featured Leonard Bernstein’s Serenade, inspired by Plato’s Symposium, and Tchaikovsky’s Romeo and Juliet, based on four scenes from the Shakespeare play. The final piece was Dvorak’s Symphony No. 8, a heavy dose of emotional Bohemian fireworks, all under the able baton of the BSO’s impressive young Assistant Conductor, Marcelo Lehninger. I approached the opening selection, Romeo and Juliet Overture-Fantasy, with some dread, having heard it probably 50 or 60 times since childhood. It leans even more toward program music than Bernstein’s Serenade, vividly dramatizing a broad range of moods such as the warfare between Shakespeare’s Capulets and Montagues and the balcony love song. I was wrong. If this is an overexposed piece, Lehninger quickly took the “hack” out of hackneyed. His reading found subtleties and dynamics I had never noticed, controlling the BSO players in great sweeps from ppp to fff and back. Led by Lehninger, this piece puts an orchestra through it paces and shows what is possible from an assemblage of fine players. It is no fault of Tchaikovsky’s, nor the BSO, that the familiar love song passage keeps turning up as background music in weird places such as Wayne’s World, South Park, and Sponge Bob Square Pants. Bernstein’s neglected Serenade stood out as the centerpiece of the concert, a work of great originality that many in the audience were clearly hearing for the first time. Eerie and obscure in parts, it explodes with Bernstein’s trademark brio and contains several echoes, some might say intrusive echoes, of the famous tritone figure he recycled later for “Maria” in West Side Story. American violinist Joshua Bell, fresh from an appearance with the Seattle Symphony where he performed the same piece to critical acclaim, put his stamp on the evening with a vibrant performance of great lyricism and virtuosity. Serenade attempts to interpret Plato’s work on the genesis and meaning of love as discussed by some of the great ancient Greeks. Mark DeVoto wondered in these pages a few weeks ago why Bernstein attempted to link to Plato, concluding that he may have had “too much Harvard” on the brain in 1954 when he composed it. If Bernstein got it right, there was a fair amount of yelling around that table in Athens in 385 B.C. It was called Serenade less for its unique form than but for the idyllic European setting in which it was composed. A detailed analysis of the Plato work is available on the BSO website. Bell, virtually dancing with his 1713 Huberman Stradivarius, opened Serenade with an exquisitely lyrical solo passage. In the second movement Bernstein introduces playful asides, still allowing the violin to retain its delicacy and dominance. The third movement brings in vigorous dialogue with the strings, sprinkled with humor, and concluding with a heart-stopping resolution. The Adagio fourth movement, a three-part song, builds on the third, with harmonies of piercing beauty emanating from the reduced orchestra. By now, Bell’s Strad had become an extension of his lithe frame. The final movement, a virtuoso turn with devilish rhythms, evokes violent argumentation among the Athenian worthies, punctuated with the full panoply of tools in the percussion section. The very Bernsteinian climax brought a standing ovation and yelps from the audience (not that this means much nowadays – audience jump to their feet on cue and for various personal reasons). The real warhorse of this program, Dvorak’s Symphony No. 8 in G, was let loose after the intermission. Generally accepted as his most modern composition, this work, wrote one critic, is among the Bohemian symphonies of the 19th century that were once regarded as a “provincial art form in fancy dress.” As recently as the late 1960s, a recording of the complete Dvorak cycle under Czech exile Rafael Kubelik changed all that, and now the 8th is firmly rooted in the concert repertoire. Audiences like the lush opening theme, which produces a feeling of softness and calm, highlighted by birdsong figures from the flutes. To this listener, the 8th combines many appealing passages of swelling strings and other orchestral effects — but mixed with a great deal of noise. Lehninger managed to haul some real music out of the brass but with what appeared to be Herculean physical effort. Dvorak’s explosive blasts jolt the experience throughout, and the fourth movement includes another crowd-pleaser, the famous trilling of the horns. It all ends in an apocalyptic eruption. Again, the audience leapt to its feet. Ed. Note: The article has been edited in response to comments. “firmly rooted in the concert repertoire”? Either you’ve spent too much time in Moscow, or you’re living in a parallel universe! The BMInt reviewer meant that the 8th entered the rep in the late 60’s. I have deleted the reference to the 9th at the writer’s request. You might also correct the maestro’s title. Sorry. The 8th (originally known as the 4th until four earlier symphonies were discovered) was in the repertoire of every major symphony orchestra practically from the time of its composition in 1889. If you simply check the performance history of any orchestra – the BSO included – you’ll discover that the 8th is one of the most popular and frequently programmed works in the symphonic canon. I think some of the confusion arises from the fact that the 8th was previously known as the 4th. When Charles Munch recorded the work for RCA, the cover titled it the 4th. So in many previous performances it was listed it as the 4th. This review was more important to get up in time to influence attendance this afternoon than it was to check facts. That is up to the reviewer, although ones that jump out at me ARE corrected, such as (most) misspellings and grammatical errors, or confusions in text, or some errors of fact. That should have alerted my synapses(obviously), but it did not. We are not a full-time team here, either. Now, when we get a staff like that of The New Yorker,…Not that we do not welcome your comment; we do. We are grateful for alert, knowledgeable readers. that February 1892 premiere, until Munch’s first rendition in 1951.
it was a relatively unknown work, as referenced by notices of the BSO tour of the U.S. that year. The Munch recording, as well George Szell/Cleveland Orchestra disc made a few months earlier, really re-established the Symphony in the repertoire, well before Kubelik’s cycle for DG. Thomas’ Chicago Orchestra. The reviews were extremely positive. I’m very flattered that denovo2 imagines that BMInt has reached the point where we can employ a full time fact checker. I’m also very pleased that BMInt exists in a community of knowledgeable writers, devoted editor and alert readers. It doesn’t take us long to get things right. Keep the comments and corrections coming. We don’t mind praise either, and do get a fair amount. I would argue that the G-major Symphony was pretty well established in the repertoire by 1961. The October, 1954 Schwann Catalog lists six recordings of the work, and that doesn’t include records made during the 78rpm era. By May, 1961, again referring to the Schwann Catalog, there were nine recordings. Bruno Walter made a famous recording with the NY Philharmonic as early as 1947. No “hack” and no amplification! We’re hearing Dvorak’s 8th quite often now. It gets as much exposure as the cello concerto and almost as much as the 9th. Last year Jonathan McPhee and the Nashua Symphony did the 8th. So pleased to see the very gifted Marcelo Lehninger rec’v the praise he well deserves. I can’t wait until the Tuesday concert! >>was in the repertoire of every major symphony orchestra practically from the time of its composition in 1889. If you **simply check the performance history of any orchestra** – the BSO included – you’ll discover that the 8th is one of the most popular and frequently programmed works in the symphonic canon. So some experts here ‘simply checked’ and found this not to be the case. Simply. Some recordings, sure. I attended local orchestral concerts in a midsized Midwestern town all through the ’50s and early ’60s as a boy, and am pretty sure I never heard it (though I’d never assert so with total certainty). ‘New World’, absolutely. And then like so many I got to know it well in the later ’60s and early ’70s, by when it really had become a staple. Verily, the Boston Symphony broadcasts have fallen on evil days. The performance of Dvorak 8 now in progress is, I can tell, quite as extraordinary as reports of the earlier ones would indicate — bravo Marcelo Lehninger — , but the jittery upside-down inside-out dynamic compression that’s being visited on the core sound material makes it virtually unlistenable. This is vandalism pure and simple. That, and the nonstop, intrusive, hype-ridden promotional jabber — it’s like being set upon at the airport by a pack of Moonies. In its own best interests, the BSO management might be well advised to take the orchestra’s broadcast concerts out of its present hands. It doesn’t have to be this way. The orchestras of Chicago, Pittsburgh, Minnesota, New York, Atlanta, Los Angeles all go on the air without the presentation coming within miles of the raucous vulgarity that’s now established as a norm in Boston. I love this city, but the BSO’s broadcasts, as now administered, serve only to lower the tone of the joint. I guess we’ll never know for sure until someones check the performance history of a wide range of symphony orchestras, not just the BSO. The NY Philharmonic, for one, displays on its website 25 program books which included this piece over a 28 year period between 1942 and 1970. If I foolishly overstated the case, I was simply responding to the statement in the original review, later edited-out, that the 8th, (and the 9th) were pretty much unknown to audiences until the Kubelik recordings came out in the ’60’s. The fact that many recordings existed well back into the 78 era indicates to me that there must have been a modicum of familiarity with the piece well before then. And national radio broadcasts of the 8th by the NY Phil (with Bruno Walter) and the NBC Symphony (with Toscanini) must have reached, I would think, a pretty large audience. So how hard to come by has Dvorak No. 8 (formerly No. 4) been? The March 1956 Schwann lists 12-inch LP recordings by (1) Thor Johnson/Cincinnati Symphony, (2) Rafael Kubelik/Philharmonia,(3) Gerhard Pflueger/Leipzig Philharmonic, (4) [?] Rubahn/Berlin Symphony, (5) Wolfgang Sawallisch/Philharmonia, (6) George Szell/Amsterdam Concertgebouw, and (7) Bruno Walter/New York Philharmonic-Symphony. ” … Munch delivers the symphony with galvanic conducting and orchestral playing of simply superb virtuosity. You may think it too high-powered but it is impossible to deny the brilliant effectiveness of his reading; it is a really tremendous performance. You will have to accept the well-known Boston trumpets, not only their incisive tone but their prominence at any moment that may seem in the least significant (and at one moment where they are not playing according to my score). “The fire and attack in the first movement do not preclude real lyricism in many passages. The allegretto, as I have mentioned, is a little charmless (and includes something new to me, where the oboe, 5 bars after letter G, plays B’s and A’s instead of the usual C’s and B’s. “In all, this performance of a somewhat diffuse symphony hangs together completely, it is absolutely remarkable for sheer excitement, the orchestral playing makes the Philharmonia under Giulini sound ordinary, the clarity of detail in both performance and recording is remarkable. My most recent (2007) Muze Classical Catalogue lists recordings by some 32 conductors, including Beecham, Harnoncourt, Tennstedt, Claudio Abbado, Fritz Lehmann, Barbirolli, Colin Davis, Mackerras, and Talich. Is the last word in? If not, it would be nice to hear from Gianandrea Noseda, Daniel Harding, Jonathan Nott, Manfred Honeck, Esa-Pekka Salonen, Jaap van Zweden, Hans Zender. It IS a lovely piece. Anybody out there know it? I believe that Munch also insisted that the trombone section utilize small-bore instruments which produced a brighter, more overtone-laden sound, perfect for the French repertoire. Some of the players at the time humorously referred to them as “pea-shooters”. At 4’10” you can see Voisin and company lined up in the back row. It occurs to me that I’ve spent a lot of my life not looking at trombones, so I’ll have to be told what exactly what we’re seeing in this clip from a 1962 telecast from Sanders Theater. In comparison the New York Philharmonic’s of the time were regarded as big bruisers as I recall. Next subject: the distinctive horn sonority that you hear from the New York Philharmonic-Symphony (as it then was) in the 1940s, especially Stravinsky’s recordings with them. Gunther Schuller once told me they — and Cleveland — used something called a “tuba horn.” It produces a big blooming outdoors Alpha male kind of sonority that I find irresistible. Bring it back! I say. Question: Is it still around and being played anywhere on this planet? Loved the Tuesday concert. Thanks to Steven Ledbetter for his excellent notes on the Schulhoff. It’s a fun piece. I’d love to hear it again in a smaller venue — not that Lehninger et al. didn’t do a fine job. In fact the balances between the quartet and the wind band were handled remarkably well. It’s just that in a small hall the strings would have more presence, I think. The entire orchestra is sounding terrific these days. What we’re missing in a music director is programming savvy most of all. Meanwhile marketing is in the doldrums. The new (now aging) website remains dysfunctional. The twitter account still thinks it’s all about classical music and seems to have trouble focusing on the BSO. Can they fill the seats for Steinbacher and Jurowski? Tuesday night’s concert was remarkable in every way. Marcelo Lehninger was thrilling in both the Romeo + Juliet and the Dvorak 8th. The BSO playing was perfection itself. I’ve heard the 8th (old # 4) live about 20 times since 1961.. Charles Munch’s performance made me fall in love with the work. Lehninger’s was the greatest of all! Schulhoff’s Concerto for String Quartet with Wind Orchestra is an interesting piece and the balance between the orchestra and quartet was handled extremely well…a difficult task. The BSO seems to love playing under Lehninger. What a great choice for the next BSO Music Director. Wonderful to have the hall returned to normal..no stage extension, speakers, drapes etc. Will wrote: Can they fill the seats for Steinbacher and Jurowski? Symphony Hall had an audience of 2/3’s capacity tonight. The Shostakovich 4th is the composer’s greatest symphony yet it is the most complex and inaccesible to the general listening public. Jarowski made it thrillingly memorable! More later when BMint review is posted.